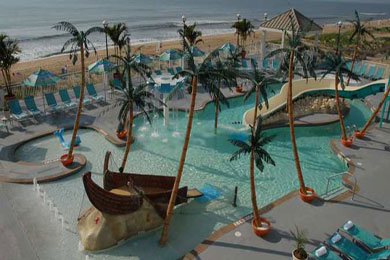 In our opinion, Hilton Ocean City Oceanfront Suites is the most luxurious property Ocean City, Md. has to offer. Families will dig the residential-style kitchen and enormous Jacuzzi in every bathroom at this all-suite hotel. And kids will literally dig the sparkling sand that stretches between the Hilton and the sapphire-hued Atlantic. When in need of a break from the beach, just toss the kids into the onsite pool, which has water fountains, slides, a lazy river and even a faux rowboat. An adult pool sits opposite the kid-activity pool — with a swim-up bar within — and both overlook the ocean. On rainy days, kids can jump into the Hilton’s spacious indoor pool that sits under a bright and airy atrium. 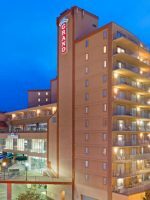 This beautiful property, offering a classic beach vacation, was built in Ocean City in 2007 and boasts 12 floors with 225 suites — two of which are penthouses built for 10 people. Every standard suite has a private balcony large enough to be considered an outdoor room with a dining table for four, and one heck of a smashing ocean view. A handful of specialty suites offer a Jacuzzi either in the bedroom or on the balcony. 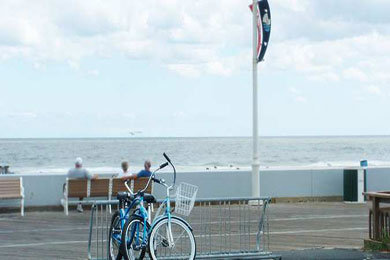 While the Hilton does not, in fact, sit on the Ocean City boardwalk — granting a luxurious distance from the sounds of the crowd — the half-mile walk to the boardwalk is an awesome opportunity to squeeze in your day’s work out, chat and enjoy the Atlantic’s gorgeousness while the kids comb for shells. Once at the boardwalk, hop the tram at 27th street and be chauffeured in open-air style to any spot along the boards that catches your eye (or taste buds). 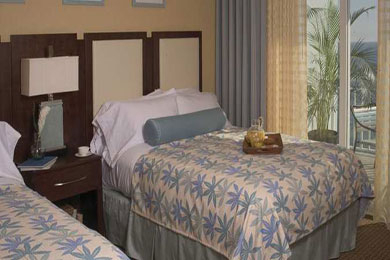 The Hilton Ocean City delivers a memorable beach vacation starting -- and ending each evening -- with a sumptuous suite. When you enter your beautiful space, you'll find yourself in a nice-sized living room with a queen sofa bed, a dining table for four and a large flat-screen TV with a DVD player. Posh touches are everywhere, such as twin light sconces, framed ocean-themed black and white photos and upscale lamps. The living room flows into a galley kitchen that your grandma would love, with a full dishwasher, four-burner stove, microwave, residential-style oven, large refrigerator and toaster. The modern parents' eyes will light up at the black granite counters, the blender for today's smoothies and the fully stocked cupboards with pots, pans, dishes, flat wear, knives, wine opener -- the works. Next to the galley kitchen is an impressive bathroom with double-vanity sinks, black granite counters, and an awesome two-person -- or four-toddler -- Jacuzzi with a rainfall showerhead above. The enormous tub fills quickly thanks to seven jets. Walk into the bedroom, which has a door that closes for privacy, and you'll find either two queens or one king bed facing yet another large flat-screen TV and a second DVD player. Next to the bed is the alarm clock and MP3 player connectivity. Open the sliding glass door to a private balcony that looks out onto a killer postcard-like view of the ocean. The spacious patio with a table for four makes dining alfresco a must. Your privacy is assured thanks to the two walls that tower up each side of the balcony. 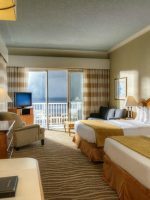 Each suite has an ocean view so don't worry about making a reservation in advance and missing out on the view -- they're all good! The only exception -- if you stay on the Hilton's ground floor, you'll have a view and easy access to the pools. 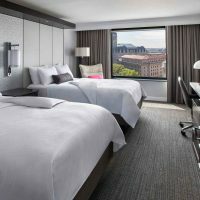 Connecting rooms, cribs and rollaway beds are available upon request and are complimentary, but each is in demand so reserve items when you make your reservation. 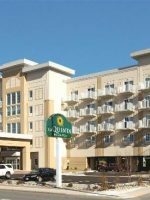 Extras in the suite -- at no additional charge to you -- include HBO and the Disney Channel, Wi-Fi, and a large in-room safe. A morning newspaper and fresh fruit are available at no charge at the front desk. If you'd like your paper delivered to your suite each morning, just ask. The Hilton also has two types of specialty suites that are just like standard suites, except with one insanely cool amenity. A dozen Corner Suites have a Jacuzzi in the bedroom (and three shower rain heads in the bathroom) and seven Terrace Suites boast a tub on the patio. Two large Penthouse Suites are also available with three bedrooms and three bathrooms that allow for the comfort of 10 guests. The penthouses boast everything found in the standard suite, plus a washer and dryer and a dining table for 10. To reserve a penthouse, call the Hilton directly at 410-289-6444. 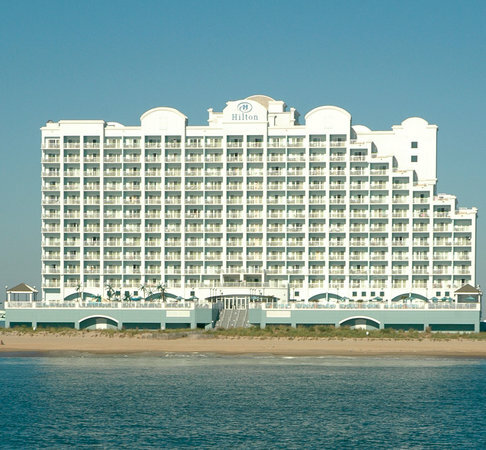 The Hilton sits on the hem of the glittering 10-mile beach with the Atlantic just beyond. A friendly rental company sets up chaise lounges, beach chairs, umbrellas and boogie boards at a reasonable fee. Send your teens into the waves and plan to see them at dinner. The Hilton doesn't offer beach towels so bring a stack from home. Lifeguards are on duty. Tip: Before a beach visit, have a talk with your family about riptides. Ocean City is known for having these currents and learning about them is not only an interesting science lesson, but will make everyone safer in the ocean. The children's activity pool is an amazing sight for kids 12 and under, with a zero-entry pool (pool bottom slopes like a beach), fountains, two slides, a rowboat of sorts, a whale-fountain, a water tower and a lazy river -- everything today's children need to stay swimming in summertime bliss. The activity pool is wreathed in chaise lounges, umbrellas and palm trees (a few sitting in the water of the pool). With the beach just beyond the activity pool, you can keep one eye on your teens boogie-boarding in the ocean and the other on your little guys. Rolled pool towels are available and light fare can be picked up in the Manana Mode Pool Bar & Grill that is open seasonally. The kid activity pool opens at 8 a.m. and closes at dusk. Lifeguards are on duty. The Hilton's indoor pool is just the ticket for those inevitable rainy days. Claim one of the many chaise lounges ringing the indoor pool, grab something tasty at the walk-up window of Manana Mode (serving light fare and cocktails), and let the good times continue! Pool towels are available, though there are no lifeguards on duty. Hours are from 5 a.m. to Midnight. 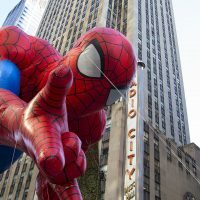 The Hilton's Kid Camp provides arts and crafts every day in the summer, from 2 to 4 p.m., with games from 4 to 6 p.m. and movies from 6 to 8 p.m.
A large arcade room is available with more than one dozen video games (both classics and modern). The Hilton's main dining spot -- 32 Palm Restaurant -- serves breakfast, lunch and dinner with kids' menus daily, from 6:30 a.m. to 10 p.m. The breakfast menu allows you to choose a buffet, continental breakfast and/or entrees from the menu. The buffet has made-to-order eggs and omelets, breads, hot items, fresh fruit, cereal and more and costs $18.95 per person. The continental breakfast offers fruits, cereals, yogurts, breads, juices and coffee for $12.95 per person. The standard breakfast menu includes pancakes, Belgium waffles, eggs Benedict and more. The lunch menu offers wraps, BLT's and burgers. The dinner menu offers salads, appetizers and entrees that pay homage to the sea, so expect plenty of seafood, along with steak and chicken. For both lunch and dinner, the kids' menu includes the usual suspects -- grilled cheese, hamburgers, pasta (butter, marinara or Alfredo sauce), hot dogs, pizza, PB&J and gluten-free chicken tenders. Tip 1: For just a $3 service charge, call the 32 Palm Restaurant, place your order, pick up your entrees and dine in your suite or on your balcony. Tip 2: You'll receive a coupon for 20 percent off for 32 Palm when you check in, and the front desk is happy to give you as many coupons as you need throughout your stay. Rumbas Lounge is ideal for a light lunch or dinner and a cocktail. 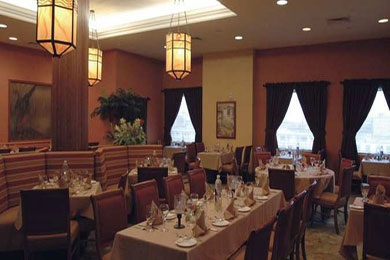 The menu offers soups, salads, and entrees similar to 32 Palm, but in a more casual setting. Open from 11 a.m. to midnight. The Manana Mode Pool Bar & Grill opens daily in the summer at 11 a.m. and closes at 5 p.m. and offers the most stunning dining view at the Hilton. Dine at a Manana cafe table and enjoy the sapphire-blue ocean beyond. Manana's popular special is $6 Bloody Mary's and mimosas from 11 a.m. to noon- and that's just the beginning. The bar and grill features a different cocktail every day, a skinny drink menu and many tasty plates, making a food-run to your suite unnecessary. On Thursdays, enjoy live entertainment from noon to 4 p.m.
Manana starters include nachos, shrimp and chili cheese fries. Entrees are large salads, wraps, sandwiches and burgers. The kids' menu is the standard with burgers, grilled cheese, chicken tenders, mac and cheese bites and PB&J. Each kid-meal is served with fries or applesauce. Meals cost around $8. A second, swim-up Manana bar can be found inside the adult pool. Starbucks sits immediately in the Hilton's opulent lobby. The Hilton's Starbucks is a quick counter stop with the usual bevy of coffee drinks, cold cereals in boxes, Good Humor Ice Cream bars, giant cookies and more. Open daily mid-March through December and only on the weekends December through mid-March. Free laundry facilities are located on every floor. Ask for free laundry soap at the front desk. Parking is free, both in a covered garage and an adjacent lot. The Hilton's business center makes printing coupons or information about area attractions easy, and a spacious fitness room sits directly next to the indoor pool with bikes, elliptical machines, treadmills (with flat-screens mounted on some), weight machines and free weights. An open-air tram rolls up and down the boardwalk all day long -- hop on at 27th street (which is at the beginning of the boardwalk). The tram costs $3 per person, per ride. Tram hours are 11 a.m. to midnight from Memorial Day to Labor Day. The Hilton delivers an utterly fabulous summer vacation, but prices -- as you can guess -- drop dramatically in the off-season. 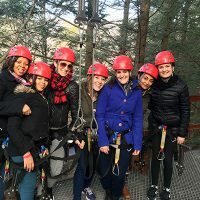 If you want to squeeze in summer fun at better rates, consider visiting during the Hilton's shoulder seasons (two or three weeks before Memorial Day weekend in May and two or three weeks after Labor Day weekend in September) when rates are often half the price you'd find in the summer. Additionally, late fall and winter prices drop even lower. Around mid-February, prices begin their ascent toward summer. October through April means chilly temps and limited hours for restaurants and stores, but those lower rates and fewer people are well worth the sweater or jacket. 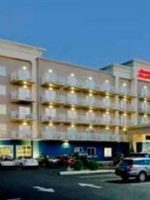 During the summer's party season, the Hilton sits about a half-mile walk from the rowdier boardwalk. That said, the Hilton is a mecca for kids, so summer brings lots of families and happy kids. Summer temperatures range from the 70's into the 80's. Fall months slip from the 70's down into the 60's. Winter months are downright chilly in the 50's -- bring your coats and jackets. In spring the thermometer starts climbing again. April and May see temps in the 60's and 70's. Ocean City, Md. sits on a lovely spaghetti-like strand of peninsula that is almost an island, but touches a bit of our continent in Maryland. That said, if you're heading to Ocean City, get cozy with a map ahead of time so that you'll know how and when bridges, tolls and traffic are headed your way. If you're heading to Ocean City from the west, you'll take highway 50 and drive over the Chesapeake Bay Bridge (known to locals as the Bay Bridge). This bridge can become snarled with traffic at any hour of the day. From the south, you'll drive US-13 north over the Chesapeake Bay Bridge-Tunnel (not to be confused with the Bay Bridge), which requires a $13 to $15 pricey-toll both ways. From the north you'll take US-13 going south. If you're visiting Ocean City by air you can choose between several airports. Fly into the Philadelphia International Airport for an easy 2.5-hour drive to Ocean City and avoid traffic-clogged bridges and sky-high tolls. 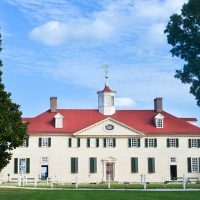 Three airports serve the DC region: Baltimore-Washington International Airport, Dulles International Airport, and Ronald Reagan Washington National Airport. All give a 3-hour drive to Ocean City, if traffic isn't bad. 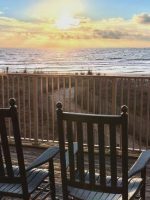 Fly into Virginia's Norfolk International Airport for a 2.5-hour drive to Ocean City and take the Chesapeake Bay Bridge-Tunnel with its toll of $13 to $15 both ways. The Salisbury-OceanCity-Wicomico Regional Airport offers daily scheduled service by US Airways only. Bands play at the Hilton's adult pool in May on the weekends and in June through August daily, from noon to 4 p.m. Toe-tap to island music and cover songs, cocktail in hand, and enjoy that incredible ocean view. Along with the live music, the adult pool sports a swim up bar. Paddle up and order any libation that sounds fabulous, never once leaving said pool. Adult pool hours are 8 a.m. to 8 p.m. Kids are welcome in the adult pool, but a lifeguard is not on duty. The Hilton's hot tub is large and overlooks the kids' activity pool -- which sounds like an odd place to put a hot tub, but is actually a genius arrangement for parents wanting to soak and, yet, supervise at the same time. Open from 8 a.m. to 8 p.m.